The U.S. Naval Academy Band marches during the burial of Sen. John McCain (R-Ariz.) at the Naval Academy Cemetery in Annapolis on Sunday, Sep. 2, 2018. McCain died Aug. 25 from brain cancer at age 81. Sen. John McCain (R-Ariz.), a former Navy pilot, Vietnam era prisoner of war and veteran lawmaker was laid to rest a week after his death to brain cancer at age 81. He was buried at the U.S. Naval Academy Cemetery, following a ceremony attended by his family, Defense leaders and academy midshipmen. 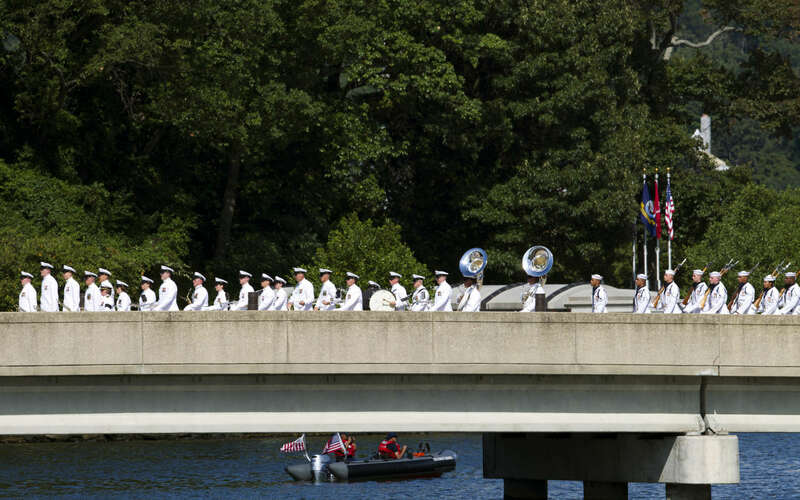 Crowds also gathered to watch his casket’s procession to the Naval Academy Chapel on Sunday, Sept. 2, 2018.